OBSCURING VEIL is a ghostlike entity conjured up by some of the most visionary “black wizards” of our times: Matron Thorn on guitars/vocals (Ævangelist, Præternatura, Benighted in Sodom, Devil Worshipper), H.V. Lyngdal on bass (Wormlust, Martröð, Guðveiki), Mories on keyboards and synths ( Gnaw Their Tongues, Cloak of Altering, De Magia Veterum, Aderlating), Jarle Byberg on drums (Urgehal, ex-Craft), and Nornin Kabukimono on voices. Mastered by Jeremie Bezier (Emptiness, ex-Enthroned) at BlackoutStudio, Belgium, “Fleshvoid To Naught” is their first observation on death and darkness, and it is made of dissonant riffs, nightmarish voices rising from the subconscious, cacophonous noises, and deranged melodies. OBSCURING VEIL orchestrate a sinister black/death metal mass of sinful abandon, a vertiginous descent into dark psychedelia, where light is banished and blindness is a blessing. 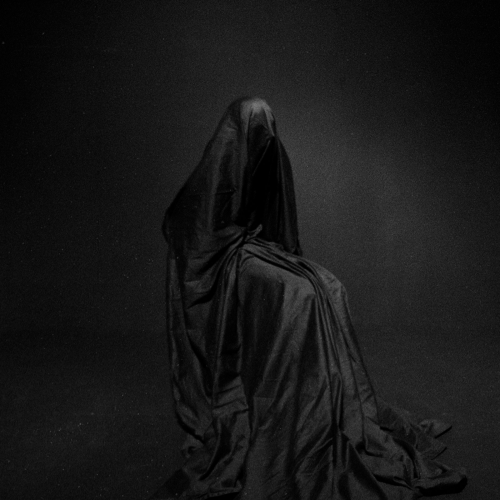 Let the obscuring veil fall on you like a merciful caress. Let it swallow your miserable lives. Be one with darkness.